12 Feb What's Your Competitive Advantage? The real estate market can be hyper competitive at times. Everyone wants a deal, and they want it now. I’ve written offers that were competing with 80 other offers, within the first four hours of a listing! Particularly for newer investors, it can be hard to figure out how exactly you’re supposed to win deals with so many investors going after the same deals. The real estate guru will often preach “write more offers” which isn’t bad advice in itself, but it doesn’t solve the problem of competing with offers that are faster, better or higher than yours. In order to succeed and stand out from the masses of real estate investors, you need a competitive advantage. You need an edge that sets you apart, and allows you to win profitable deals when you’re going head to head against the competition. Here’s 6 different ways investors find an edge. They aren’t all for everyone, but if you can find one or two that work for you, it’s going to put you miles ahead of the competition. One of the most obvious ways to succeed in real estate is to get better at finding deals than everyone else. There are a million ways to do this. The key is to differentiate yourself, instead of going for the low hanging fruit, which is what the masses do. These are just a few of the more unconventional ways of finding deals. What’s the strangest way you’ve found a deal? Another way investors get ahead is by financing deals more efficiently than their competition. The cash buyer can usually offer more than the hard money buyer, because they don’t have to pay interest out of their spread. The buyer who uses seller financing can pay even more, while taking on less exposure. Hard money can work if you have an advantage in another area, but you’ll often find that the investors closing the most deals have some advantage in the financing department, whether it’s working with private investors, using cash, or learning how to negotiate agreeable terms with motivated sellers. Anyone who works in the real estate industry knows the difference between retail construction costs and what a professional investor will pay is night and day. If you’re paying retail for your fix and flips, you’re not going to last very long in this business. I used to pay about $2,500 for a brand new bathroom (which I’m sure many of you can do it for cheaper). On a recent trip home to the east coast, my brother told me about his $30k quote for his bathroom, which was normal to him. I couldn’t believe it. If you’ve got an edge when it comes to rehab costs, chances are you are a contractor, you have your own crew, or you’ve partnered with a crew who is used to working with investors, and knows what it is you’re looking for. Keeping rehab costs low is essential to finding profitable deals with a healthy spread. Market savvy comes into play when you are more educated than your competition. Maybe you know what looks like an expensive problem isn’t really that expensive. Or maybe you know that a neighborhood is about to blow up due to the new Whole Foods down the street or the light rail around the corner. Staying educated on the entire buying and selling process, construction process, and economic forces at the local and national level will make sure you don’t make costly mistakes, and that you make the best offer for the property. As soon as a new deal comes on the market, I’ll call the listing agent and let them know I am going to write an offer. I’ve put properties under contract within hours this way, and locked in equity that would be gone if the listing agent had waited another day. Probably not the best practice on the listing agent’s part, but it has resulted in some pretty healthy spreads on my end. Speed is a result of a combination of things. Primarily, the ability to find, analyze and fund a deal quickly. You’ve got to know your market, know what a property has the potential to be worth, understand what it will cost to buy, fix, hold and sell, and have the cash or other means to write an attractive offer with a quick closing. We all know terms are important when it comes to landing deals. A cash offer with no inspection period and a 10 day close is going to beat an offer with traditional financing, a 10 day inspection clause, and a 30 day close every single time. Learn how to offer good terms by educating yourself on construction, finding a financing source, and by understanding what’s important to the seller. If you can take care of their problems, they will usually be more than happy to take a little less for their problem (property). Niching down is one of the best ways to carve out a profitable specialty for yourself in any type of business. If you only go after contaminated properties because you know how to remediate yourself for cheap, you’re going to have a lot less competition than if you will buy any property that comes your way. These niches tend to be riskier, or more unknown to the average investor, and as a result, you can get a lot more deals once you understand what goes into making a deal like this work. These are just a few of the ways that an investor can find a competitive edge to win deals over the average investor. We all need to find something that works for our situation and our style, and use it to our advantage. P.S. 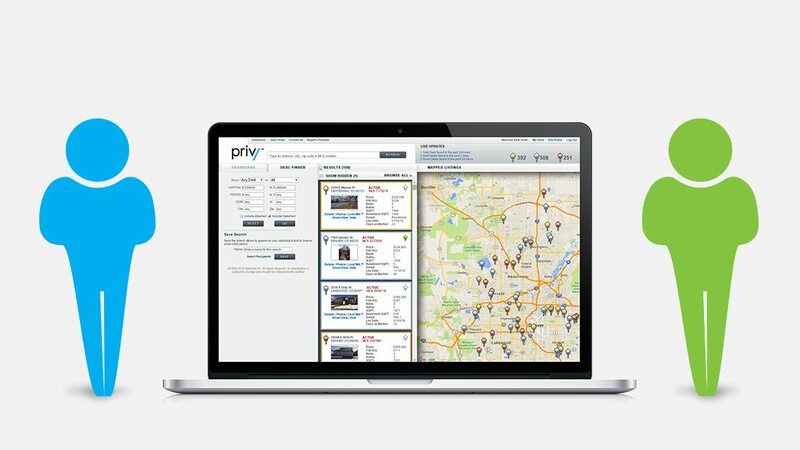 Whether you’re a real estate agent or investor, we think Privy can give you a big competitive edge. With the ability to find, analyze and track deals with the click of a button, and streamline communication for your whole team, we think you’ll be closing more deals in less time. Check it out for yourself at getprivynow.com.